Windows Phone 8 GDR2, the latest software update for Microsoft's mobile platform, is mainly focused on quality improvements (bug fixes and performance improvements), but there are a number of new features. 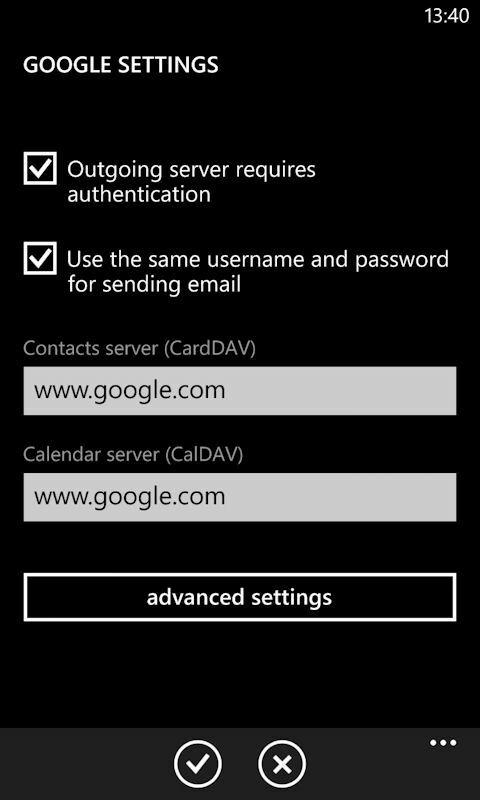 One of these is the addition of CalDAV and CardDAV support when setting up a Google account (Gmail, Google Contacts, and Google Calendar) on a Windows Phone device. In this feature we explain the background to this new feature and offer a brief video demo. So what's the background to the addition of CardDAV and CalDAV? Why is it important? Earlier this year Google announced the end of life for Google Sync, a service that gave access to Gmail, Google Calendar and Contacts via Microsoft's Exchange ActiveSync protocol. This was important because it was the way Windows Phone devices connected to and synced with Google's online services. The withdrawal of Google Sync support only applied to new account set ups (i.e. it would keep working if you had already set it up) and Exchange ActiveSync support continues to be available for Google's paid services (Google Apps for Business), but nonetheless was clearly going to have an impact on Windows Phone users. Google did note that it was offering similar sync access via IMAP, CalDAV and CardDAV protocols. However, this presented a potential problem for Windows Phone users, as the latter two protocols were not supported by Microsoft's platform. Unsurprisingly, given the importance of email, calendar and contacts on the modern smartphone, and the popularity of Google services, the withdrawal of Exchange ActiveSync support caused quite a fuss. Subsequently, Google announced that it would continue Exchange ActiveSync support for Windows Phone users until July 31 2013 and Microsoft announced it would add support for CardDAV and CalDAV to Windows Phone in a forthcoming software update. This guaranteed that service would continue as normal for users, without any interruptions. Microsoft is fulfilling its earlier promise by shipping support for CardDAV and Cal DAV as part of Windows Phone 8 GDR2. It's presence is not immediately obvious because the functionality only applies when setting up and using a Google account (i.e. you can not set up an CardDAV or CalDAV specific account). Moreover, you should never have to enter CardDAV and CalDAV details yourself as the set up process for a Google account is automatic, requiring only an email address (username) and password to be entered by the user. However, it presence can be seen by viewing the details of a Google account on Windows Phone after it has been set up (via the emails+accounts module in the Settings app). This will show that email is being retrieved via the IMAP protocol and that contact are calendar information is coming from Google's CardDAV and CalDAV servers respectively. This new use of Google CalDAV and CardDAV obviously applies when setting up a new Google account, but it appears to also apply to existing accounts. When setting up the Nokia Lumia 925 we restored a backup from an existing device (Lumia 920), which included a variety of settings including an already configured Google account. 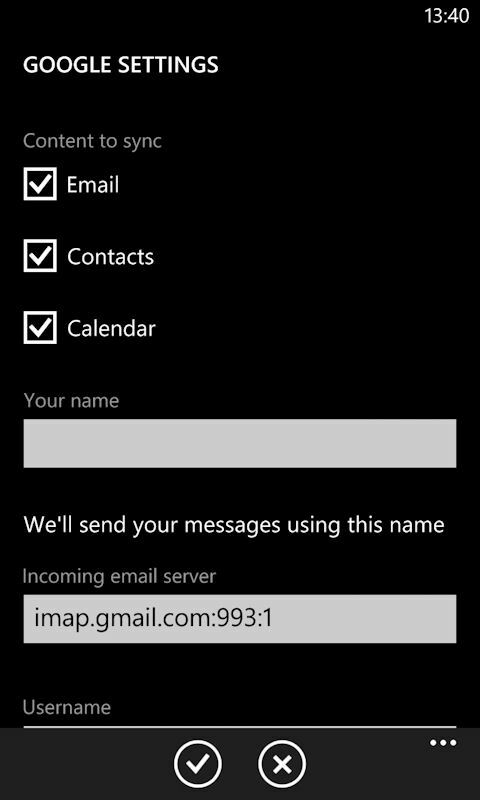 This existing account, when restored to the Lumia 925, was set up using the new IMAP, CardDAV and CalDAV functionality. It seems reasonable to assume that this same transition from Exchange ActiveSync to IMAP/CardDav/CalDAV will also apply when existing Windows Phone 8 devices are upgraded to Windows Phone 8 GDR2, although this is not something that we have not been able to confirm. The important point here is that Windows Phone devices will continue to connect to and sync with Google services without any int eruption. In fact it's likely that the majority of users will not realise that has been any under-the-hood change because they are not required to take any action. So does this new IMAP, CardDAV and CalDAV support provide exactly the same experience as that provided by the previous Exchange ActiveSync protocol? Not quite. Email, contact, and calendar information can be synced to and from the device as before, and there are no obvious glitches or differences. However, the intervals at which the sync take place may be different, depending on your previous set up. A Google account, configured on Windows Phone 8 GDR2, can be set to download new content every 15 minutes, every 30 minutes (default), hourly, every 2 hours, or manually. Previously, when using Exchange ActiveSync, it was possible to select a "as items arrive" option, something that is still available as an option for other Exchange enabled accounts. This means that, in the move to the new IMAP, CardDAV, and CalDAV protocols, Windows Phone users using Google services have lost the option to have new information (email, calendar, contacts) pushed to their device immediately. This is unlikely to be a major inconvenience for most users (note that, despite the availability of an immediate option, the previous default download interval was also for the 30 minutes). However, for those who feel this immediate push functionality is important the change may be enough to provide the push needed to switch to Microsoft's Outlook.com based services. The introduction of CardDAV and CalDAV support and the changes to way Google accounts are synced with Windows Phones are part of the Windows Phone GDR2 update. This update will be available for all Windows Phone 8 devices. Microsoft has not provided a specific time frame, saying only that it will roll out "later this summer". Given the deadline on Google stopping Exchange ActiveSync for Windows Phone (July 31st), this would suggest a July or August initial release date.